We take Withings’ cheaper fitness hybrid for a spin to see if the savings pay off. Wearables need to be wearable. 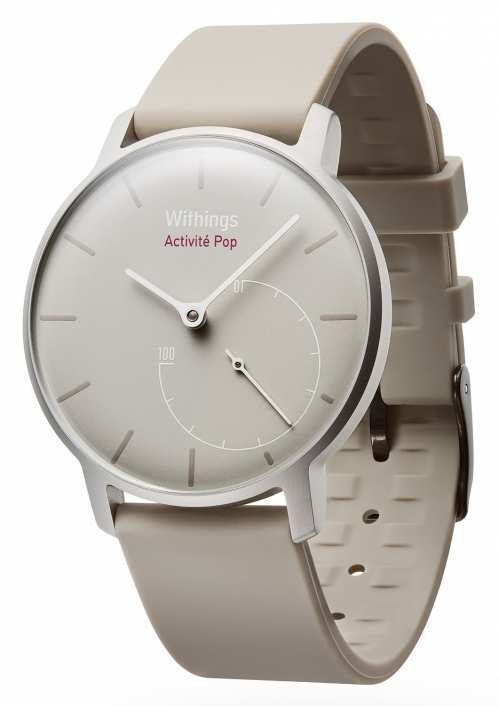 That’s the ethos at Withings, the French company following up the gorgeous looking Swiss-made Activité with its cheaper offspring, the Activité Pop. At £119 / $150, the Pop is an iPhone compatible, fitness tracker-watch hybrid that’s set to appeal to the masses more than its bigger, brasher, brother. But does the cost-cutting come with some unwanted compromises? We’ve had the Withings Activité Pop strapped to our wrist for the last couple of weeks. Read on to find out…. 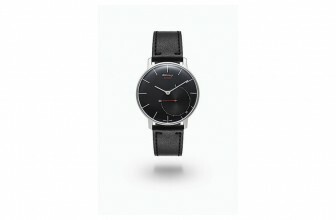 The original Activité, which is around three times the price of the Pop, uses premium materials such as scratch-proof domed sapphire glass, stainless steel and French calf leather. 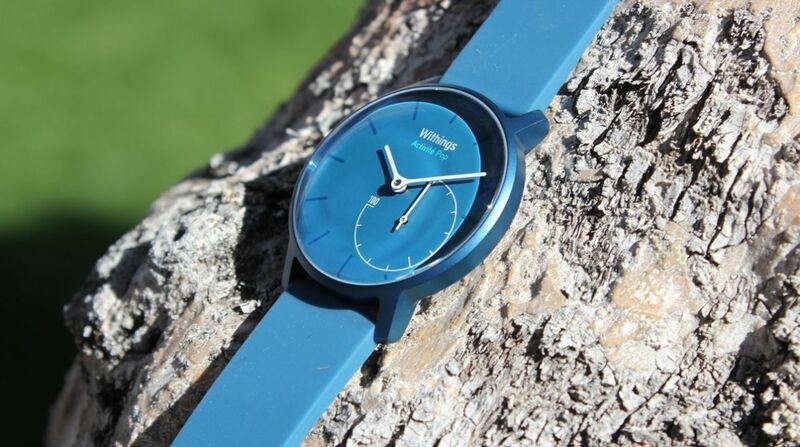 Withings’ new arrival is constructed from a PVD-coated metal, features mineral glass and has a silicone strap. It feels anything but cheap though – the rubber is soft, texturised and stretchy and it’s incredibly comfortable to wear. As stated in the intro, we’ve had the Pop on our arm for a couple of weeks now (including a few nights sleeping with it on) and there’s been no skin irritation issues to report. The watch face may not sparkle quite as much as the original, but the Pop is still fantastic looking and, with a range of colours and straps on offer, you’re bound to find one you like. All colours are unisex, in theory, although the sand option is the most feminine. While it’s very compact compared to other watch-like fitness trackers, the Pop is slightly thicker than a regular 1.3-inch, 18mm strap watch. But you’ll hardly notice the small rear-bump (where the battery and sensors are stored) while wearing it, and it’s not exactly a device that stands out. To a non-techy bystander, the Pop looks like a regular (and stylish) wristwatch. On the watch face is a pair of analogue hands and non-numbered five-minute interval markers, along with the 1-100 dial that represents your progression towards your daily step goal. Unlike its more expensive brethren, this dial isn’t double glass domed and there’s no added texture on it. There’s also no 50 marker, but that’s hardly a deal-breaker. The ‘Swiss-Made’ tag is also missing, for obvious reasons – this one is produced in China. Setup is a doddle – the watch pairs to the app and sets the time automatically based on your smartphone. There is a calibration process to go through – to make sure the hands are all in the right places – but it’s really straightforward. The reason for this is it’s actually a digital watch powering analogue components. The Pop knows how to move its hands at the right pace, you just need to get them in the right place to begin with. A cool sidenote – if you change time zones while wearing the Pop, it automatically resets itself. It does this using your phone’s time setting though, so don’t expect it to change mid-flight if your mobile is on airplane mode. You can set a silent alarm for the Pop using the Withings app so you’ll be alerted with a series of vibrations at your desired time. It’s a touch annoying that you can’t stop this alarm once you’re aware of it though, you need to just wait for it to stop – it’s around 12 vibrations. You can also sadly only set one. Checking the alarm time on the watch face is simply a case of double tapping the glass and watching the hands spin around to display the programmed time. Another bummer is that, although the app lets you set reminders (get some milk, go for a run, clean the car and so on), they just appear as pop-ups on your smartphone – the Pop doesn’t buzz at the same time, which seems a wasted opportunity. 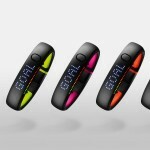 If you hit your daily step goal, the Pop’s hands spin for a bit, like a little analogue party, and the device buzzes. The counter then returns to zero and starts again. It’s a bit underwhelming but hey, if you’re buying a Withings Activité device, you’re not doing it for onscreen updates. That step goal is 10,000 and not a step more or less. Despite the company stating on social media that the option to change the goal will be hitting the HealthMate soon, it hasn’t yet. 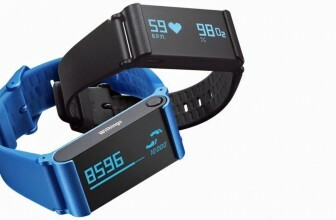 10,000 is also a lot of steps when you consider that Withings is a lot more stringent than some of its rivals. We’ve found the Pop to be pretty consistent with regards to step-recording to other devices from the company that we’ve tested – i.e. 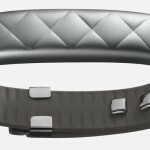 it tracks less steps than the likes of Fitbit or Jawbone. Step counting using an accelerometer and an algorithm based on personal statistics isn’t an exact science, and is a relative measurement depending on the device you’re using. However, we think that it’s a bit harsh that an 8km run, combined with about 20 minutes of walking, still doesn’t mean a 100% goal achievement on 10,000 steps. This was the case on one day for us while testing. Talking of running and you should consider the Pop a basic assistant rather than a training device. That 8km run we mentioned was tracked as 7.3km of running and 1.7km of ‘other’. There’s no GPS, so it’s not a dedicated running device and you should take its activity recording results with a pinch of salt. Sleep tracking data is displayed in a similar fashion to activities in the HealthMate app, and the good news is that sleep detection on the Pop is automatic – you don’t need to press any buttons before nodding off. We found the sleep monitoring to work pretty well and it helps that the Pop is so comfortable to wear. If you’re used to wearing a watch to bed, you’ll have no issues keeping it strapped on. The HealthMate app is also used for the Withings Smart Body Analyzer and the Pulse tracker, so you’ll see empty sections for weight (unless you manually add it), heart rate and elevation within your activity. This is a tad annoying but you can pull in extra data from some third party apps to fill in the gaps and Apple Health is compatible too. The one major downside is that the Withings Activité Pop is only compatible with iOS at the moment, although we’re told Android support is imminent. With the Apple Watch on the horizon, it makes sense for Withings to work on Android compatibility as fast as it can. The Withings Activité Pop is powered by a regular CR2025 coin battery, and you can expect a power-cycle of around eight months. You’ll get a little tool in the box to open the back of the watch, and it’s just a case of swapping the cell out. This tool can also be used to reset the watch using the button on the device’s rear. I have been using the Withings Activite Steel for 2 weeks. While I was really excited to get this, especially as a Lightning Deal, and I really WANT to like it, it's just "okay".APPEARANCE AND BUILDThe watch looks classy, and notice I call it a watch? It truly looks like a normal watch, people are amazed when I tell them it is an activity and sleep tracker. The steel case has held up well, I don't have any scratches or nicks(yet). Same with the glass. I have rubbed/bumped it against door frames when moving furniture and worn it while working outside(horse ranch), so I didn't expect it to survive the first two weeks how it did. There literally isn't a mark on it yet. I had planned on replacing the silicon band with a steel or leather watch band, but I just haven't gotten to it yet and the silicon band has kind of grown on me. It stays relatively clean, washes easy(even dried paint on it), and dries fast.FUNCTIONThis is where it is just okay for me. I was shocked when my first few days didn't count many steps. Granted, a lot of my steps I am carrying items- so my arms don't swing free. But other activity trackers have managed to still be fairly accurate. I compared this to the built in iOS Health app(which isn't very accurate) and this consistently counted 20-40% less steps! Call me a baby, but I felt cheated on my daily steps. I contacted Withings about it and they had me perform a hard test of syncing, walking exactly 50 steps, then syncing again and reporting to them how many steps it counted. Well, it only counted 40/50 steps. That's exactly 20% off! Their response- "It appears that you [sic] watch is properly counting steps." SERIOUSLY?!?! Twenty percent off is within their standards?The sleep tracking function is also just okay. It is strictly movement based. The minute I hit the pillow and my arm is stationary- I am in "light sleep". It normally takes me about 30-60 minutes to fall asleep, but I lay still. I don't expect this level of sleep tracker to notice that, but I know some others do if they track heart rate and perspiration.The alarm function needs improvement, and everyone has been asking for it. You can only set one alarm- PERIOD. You can specify which days of the week it goes off, but that is it. You cannot set a weekday alarm for 6:00 AM and a weekend alarm for 8:00AM, you would have to modify your one alarm each time you want to change the wake up time. This seems to me it would be a simple fix in the app, but it has yet to come in the updates. Also, the alarm vibrates a predetermined number of times then STOPS. There are no options to have it snooze or vibrate later if you don't go into the app to tell it you are awake. I am a deep sleeper, I have slept through the vibrating, but I always have other alarms on my phone since I knew this going in. Also, it has never woken me up at any other time except the exact time I tell it to. It is supposed to wake you during light sleep(I set it for within an hour of my wake up time). I have had light sleep in that period but it has not taken advantage of it. I have even woken up before the alarm and thought "I wonder if it will vibrate since I am awake... (roll over) ...nope, I guess not".So, overall, I'm undecided if I will keep this. It might be going back to Amazon as right now it is just a fancy looking watch. I can't rely on the steps, or sleep, but the alarm has potential. The fact that Withings' goal is less than 80% accuracy doesn't convince me to hang around and see if the bugs are worked out. Here are my initial thoughts after owning this for 11 days now.First, I want to start by stating that I have owned an Apple Watch Sport for a year now. While I have had fun with it for the past year, but the novelty has worn off for me. For starters it is bulk, heavy, not really that great looking, and just seems to constantly interrupt my life with notifications and information.I was eyeing the Activite Pop when the Apple Watch was announced, but decided against it. So, as I grew tired of my Apple Watch, I turned back to Withings and saw they released the Steel and decided to give it a try. I have to say that this thing looks really sleek and stylish. I actually like it more than the Apple Watch as far as form goes. The round dial, simple minimalistic markings, and steel case and hands make this look very nice. If you pair this with a nice leather strap it really makes it look great.This leads me to the included watch band/strap. First, the thing is cheap as heck. For $170, they could include a much nicer band. The material is very cheap and uncomfortable. I used to think that Apple's fluoroelastomer was a joke, but there is a huge difference in comfort between the materials. Even the buckle and loop are crappy, with sharp edges that kept catching on things or stabbing me. The first thing you will want to do is buy some replacement straps.The only style element that I am not pleased with is the 18mm strap width. 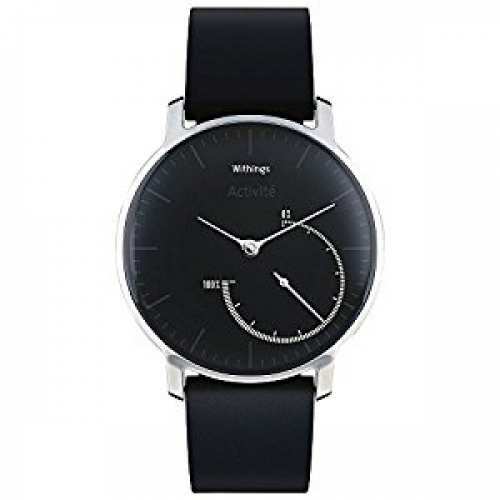 It is obvious that Withings was trying to strike a balance between male and female sizing and decided to try and strike a balance. The end result is that watch bands are not quite as easy to find at this size, most are female oriented, and on a thicker wrist the watch band looks just a bit too dainty for my taste. I would prefer a 20mm or 22mm strap width for my wrist, so I wish they made this in two different sizes.As for performance, the watch seems to measure steps relatively accurately. I state relatively as I seem to log about 40-100 steps while I am sleeping, so it is not the most accurate. My Fitbit would always show less than 10 and I charged my Apple Watch at night (since it doesn't do sleep tracking), so I can't speak to how it compares in this regard.As for sleep tracking, well this is a complete joke. Out of the 11 nights I have slept with the watch on, it has only tracked sleep 5 nights. This is less than 50% of the time that it has accurately identified that I actually slept. Out of the 5 nights it said I slept, 3 of them it said I slept less than 4 hours (which is about 3-6 hours off depending on the night). Only 1 night (the first night oddly enough) did it actually log my sleep correctly. So as far as I am concerned, it has tracked my sleep accurately 9% of the time I have owned it.Because of this poor performance, I opened a support case with Withings and it was closed the following day without anyone contacting me. I replied to that email and never heard back. I then opened a second ticket and had not heard back as of 7 days later. I also opened up 3 other tickets about other questions and issues and have yet to hear back on those after 8 days. I just reached out to them on Twitter to see if that helps, but as far as I am concerned anything over a 1-2 day response time for a $170 product is pretty bad customer service.The app seems to be syncing periodically in the background, but I try to open it a few times a day to make sure it keeps things synced up. That was definitely a nice feature of the Apple Watch, never having to worry about the steps syncing. The app syncs steps and sleep activity with the Health app in iOS. One odd thing I notice is that sometimes the time shown under my step count is a couple hours in the past, even though the app claims to have synced everything up to the current moment.I was disappointed to see that you can only log weight automatically if you have the Withings scale and to log calories you have to use MyFitnessPal. The app does not read from Health, so if you use other apps or devices it will not sync back to the Health Mate app. For example, I log my food using LoseIt and I have the Fitbit Aria scale. I have to manually log my weight in the Withings app (even though MyFitnessPal is synced with my scale) or I can go and buy another $100 WiFi scale, which seems ridiculous to me. I don't know if I want to abandon all my food logging history by switching apps, so I haven't yet made the move.In the end, I haven't decided if I am going to keep the watch. Part of me is frustrated with the support experience and this is making me question if I should keep it. The app itself could use several improvements and the lack of support for LoseIt and Fitbit Aria (or an API to load these data points) is also pretty annoying to me and has created a disconnected experience for me as a user. Lastly, the lack of accurate sleep tracking is another issue for me. Basically, if I keep it, then ii is most likely due to style and not function. LOVE this tracker thus far! Very comfortable to wear, looks stylish and I have received many compliments. I also like to watch the tracker function go from zero to 100, and start over!As I also use CPAP and have an app monitoring my sleep I wasn't too worried about tracking that. I have discovered that the sleep tracking function doesn't jibe with my CPAP data as to length of time sleeping. However perhaps it does give clues as to whether I am restless while asleep, which is why the length of time sleeping doesn't seem to match. I would love more information on how they track or what the tracker uses as data to determine sleep and the levels of sleep it says it tracks. On one occasion it said I was sleeping but I was reading the news.As I don't run unless it's to save others or myself from an horrific event, I do not have experience with the runner tracking. However tracking my walking is very handy in helping me to analyze how much I am walking and motivating me to walk more. I really like to see the dial move up.I did have a little difficulty getting the three taps to acknowledge and show me the alarm time. But eventually I found the sweet spot and it worked. What a beautiful design for an activity tracker. I would love to buy it. Thank your guys for the review.